14th Annual Toast To Life Gala presented by Christopher A. Salerno benefiting the HIV/AIDS programs and services of Resource Center Dallas. Visit www.toasttolife.org for information about sponsorships, auction item donations, or to purchase tickets. 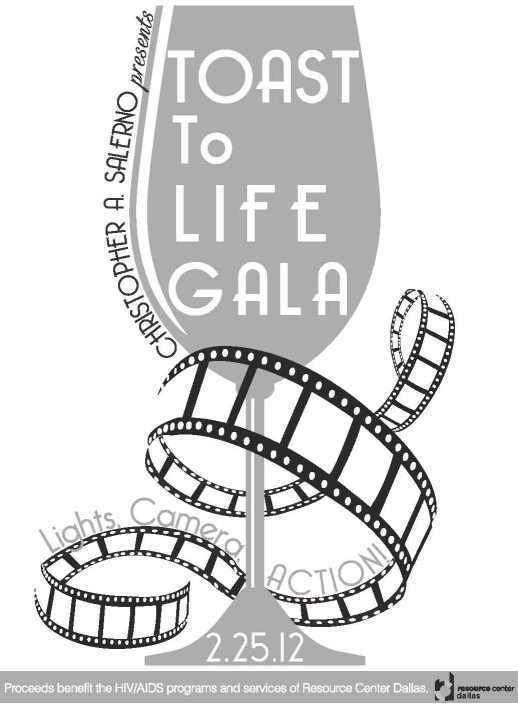 With an annual attendance of more than 800 people, Toast To Life Gala has raised more than $2.4 million since its inception in 1999, and has become one of the most eagerly anticipated fundraising events of the year. The centerpiece of Toast To Life Gala has always been the culinary fare presented by a collection of Dallas’ most popular restaurants, along with free-ﬂowing wines and spirits! Guests indulge in the latest epicurean creations prepared by prominent Dallas chefs while participating in the Silent and Luxury Auctions – all with the knowledge that 100% of the evening’s proceeds directly beneﬁt the HIV/AIDS programs and services of Resource Center Dallas. The over-the-top auctions have grown in focus to include a vast array of local restaurant participants ranging from fine dining to casual favorites, luxury amenities, and unparalleled travel packages. In addition, many well-known local artists contribute one-of-a-kind pieces, with every guest given an opportunity to walk away with something special. For 28 years, the Center has provided programs of interest to LGBT individuals and critical assistance to people living with HIV/AIDS and their families. Annually, staff members and more than 1,100 volunteers provide services and education to more than 50,000 individuals in the Dallas-Fort Worth Metroplex. As part of a comprehensive approach to treatment, education and prevention, the Center administers programs serving the HIV/AIDS community, including: dental care; nutrition programming; health insurance premium and co-pay assistance; an HIV/AIDS helpline; and support groups designed to empower community members living with HIV/AIDS. From providing care to HIV+ individuals and their families to educating students and corporate executives about LGBT issues, the Center is proud of its commitment to and delivery of a full continuum of services to people in need. Join us in celebrating our past, present, and future dedication to the North Texas HIV/AIDS community as we raise a glass, and a fork, in a very special Toast To Life Gala! When a group of artists began hashing gallery politics and the limitations often presented by juried shows, the artists did what they do best. They stepped outside the lines. They reached outside the box, and they came up with an original idea. An idea to present an unfiltered art display, unlike any other exhibit you’ve experienced. ArtHash Open Salon Show will not be curated, with expectations of presenting the public with an uninhibited view of what’s really happening in the Local art scene. This display will be unique in the sense that over 50 participating artists will display artwork of their own choosing. There will be nothing blocking the way for you to view fresh, innovative, raw talent. In this day and age where stars are formed by public opinion on venues like youtube, we believe the same applies for the art world. You decide! Assuming you won’t miss the stuffy gallery scene this is your chance to see what the artists want you to see. All art will be reasonably priced, allowing the perfect opportunity for the seasoned collector, as well as the first time collector. If you love art, then step outside the lines with the ArtHash artists and join Kettle Art in experiencing art as it is intended… unabashed, and unbelievably imaginative. Art Conspiracy is a nonprofit community that conspires to bring artists and musicians together, raise funds, and activate awareness for regional creative programs and causes. To be an altruistic friend, resource, and platform for the regional creative community. September 10, 2010 – DALLAS, TX – For the past few years it seems that chilly temperatures were as much of a part of Art Conspiracy as the stellar art, raucous live auctions and music from local bands. 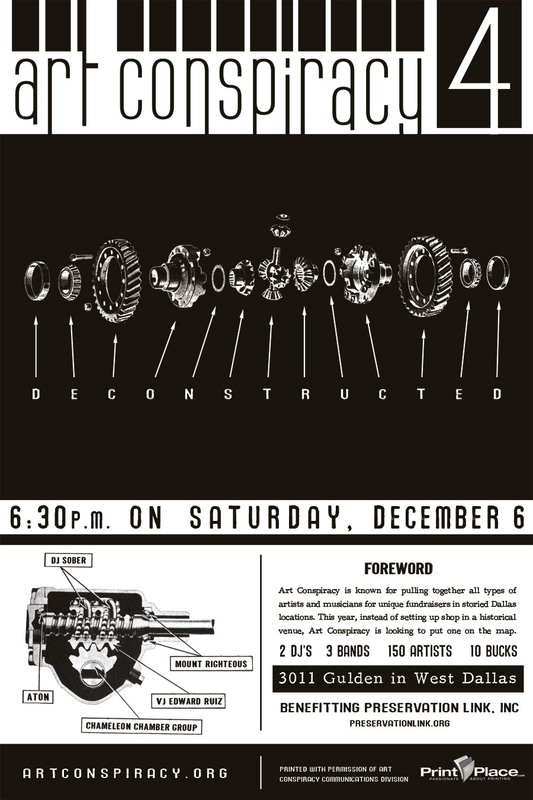 This year you can expect the same Art Conspiracy that you know and love, but this time you can leave your knit caps and woolly gloves at home since we’re moving the event from December to October. Art Conspiracy 6, will be held on October 23rd at 511 West Commerce in Dallas. This year’s Art Conspiracy will be hosted by KXT-FM’s Paul Slavens, will feature live music from Ishi, Seryn and Dem Southernfolkz, dynamic stage design from Edward Ruiz and Courtney Miles and art from 150 area artists. Money raised at Art Conspiracy event will be donated to Today Marks the Beginning, a non-profit organization that uses art to impact awareness of social issues and teach children about non-violence. Students participating in TMtB’s MasterPEACE: Young Artists Making a Kinder World classes will be contributing some artwork for auction during Art Conspiracy. This year, Art Conspiracy is once again partnering with Art&Seek, which brings coverage of North Texas arts and culture to KERA FM, KERA television, KXT 91.7 FM and to the web at atandseek.org. And just like last year, the Art&Seek team and volunteers will be on-site at Art Conspiracy, offering all co-conspirators the chance to quickly create a piece for the Art&Seek ConArtist Gallery. * St. Anthony Community Center, a center that offers visual art, music and dance to more than 800 children in South Dallas. 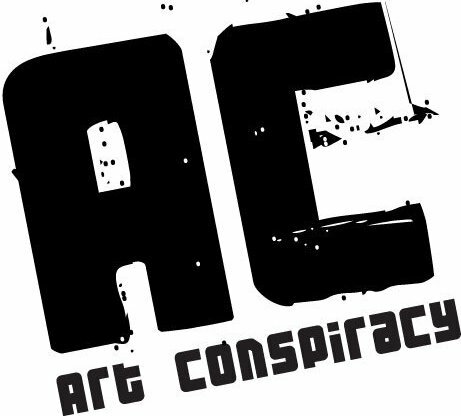 Art Conspiracy organizers, musicians, and artists are available for interviews. For more information and/or Art Conspiracy artwork, please contact Cari Weinberg at cari@artconspiracy.org or call 214-794-3510. Just-Us League, has teamed up with the Hamilton-Smith Organization and the Japan-American Society of North Texas to announce an art auction fundraiser expected to double their primary goal of $10,000 for disaster relief efforts to our sister city of Sendai, Japan. 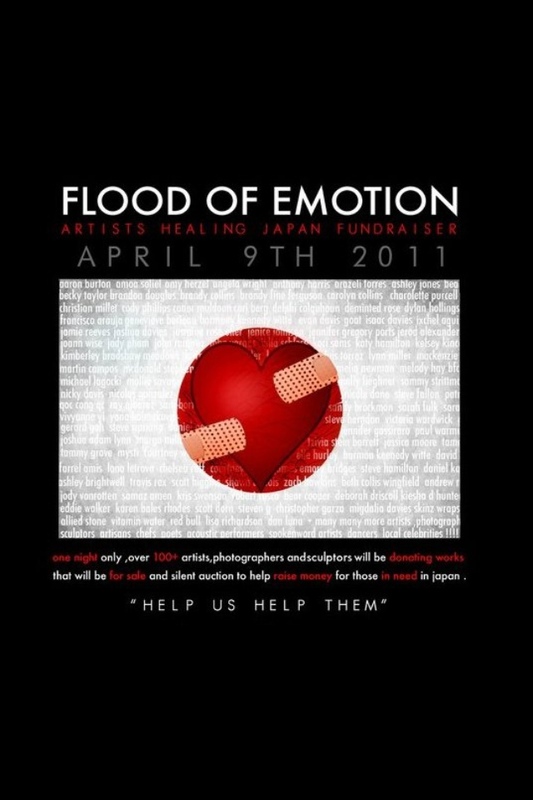 The event “Flood of Emotions-Artists Healing Japan ” began as a away for local artists to help out in the way they know how, by expressing themselves. 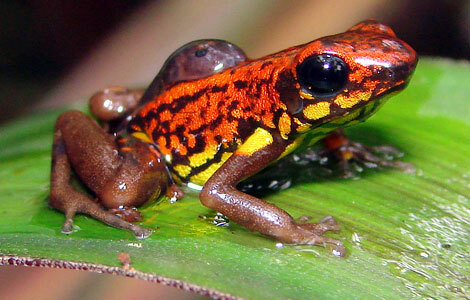 Within days of conception, the list of donating artists, musicians, poets, and services exceeded 100. 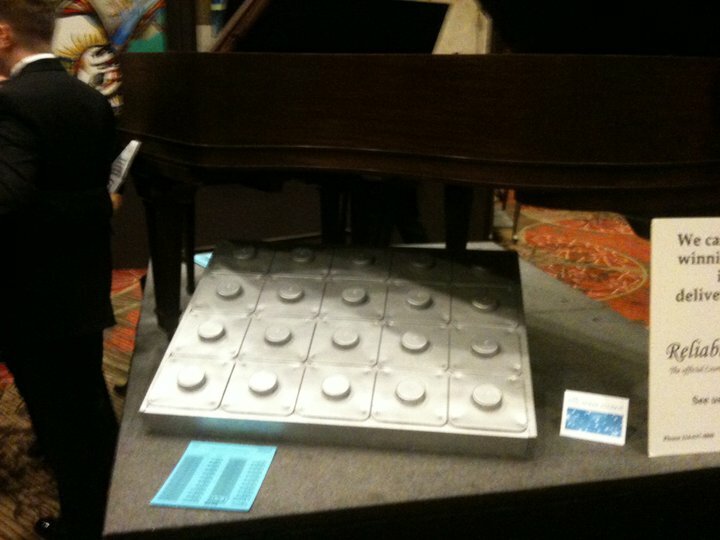 Now the event has expanded to over 200 pieces of original art and auction items. Artists as far as New York City have donated their original art works to be auctioned. One of the most touching contributions is that of Manasha Garcia, who is donating three etchings by Jerry Garcia of the Grateful Dead, along with a work of her own and a print by their daughter Keelin Garcia. On April 9th, hundreds of people will gather together to either donate or purchase pieces of original art to raise an anticipated tens-of thousands of dollars of which 100% will go directly to aid relief efforts to help Japan heal. Sendai and Dallas have been International Friendship Cities and part of the Japan-America Society of Dallas/Fort Worth since 1997. From the time when the alliance formed, the cities have shared cultures and experiences through exchange programs. Now, as Japan tries to recover from the earthquake, tsunami and nuclear crisis, much concern has risen for Dallas’s Sister City. The Hamilton-Smith Organization and Japan-America Society of Dallas/Fort Worth Sendai Relief Fund are organizations helping ensure the donations will go directly to relief efforts in Sendai. About The Just-Us League – We are non-profit collective of Dallas based artists that perform vast collaborative paintings for LIVE audiences every month. At the end of 2011 these collaborative pieces will be sold and proceeds will go to HAL Helping Artists Live . The Just-Us League believes art has the power to effect culture and impel action for social change through creating art. Hamilton Smith Foundation – (formerly Nick Smith Foundation) was founded on the belief that all people deserve the best quality of life and together we can create a synergistic relationship to support our communities. One earth, one people. The Japan-America Society of North Texas – The mission of the Japan-American Society of North Texas is to contribute to mutual understanding between the United States and Japan by educating the Dallas/Fort Worth community about Japan and the U.S.-Japan relationship; providing opportunities for friendship and meaningful interaction between Japanese and Americans; and providing a forum for dialogue between Japanese and American businesses and professionals. Allied Stone is a beautiful 30,000 square ft stone and marble gallery which, at one time, was the old Lamborghini dealership. Serving drinks for donation plus free red bull and vitamin water! and other unique sale and silent auction. 120 ft main wall where hundreds of art pieces will be displayed for sale and silent auction. This will be an event like no other!!! The Art of Skateboarding was recently featured on NBC News. One on my decks were in the show and made it on the news. I will have a piece of art at the Black Tie Auction on Friday, November 5th. The Auction begins at 7:00pm. 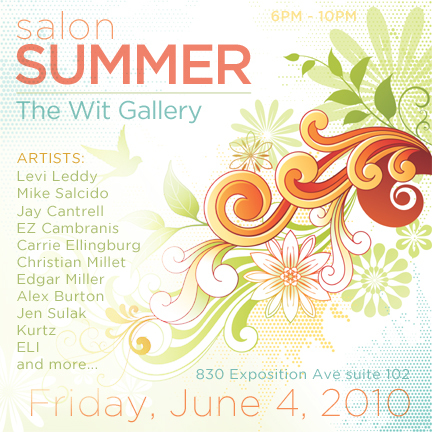 It’s “Salon Summer” at The Wit Gallery! And we are mixing it up a little this summer at the gallery! 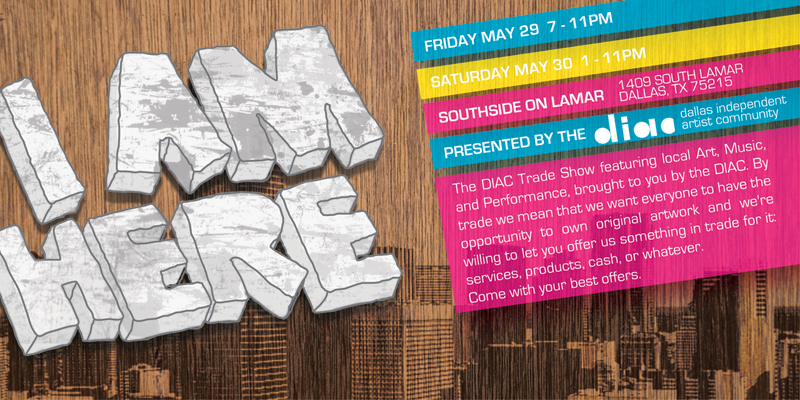 Lots of great art and artists sure to please everyone! Featured Artists thus far include: Jay Cantrell, EZ Cambranis, Christian Millet, ELI, Mike Salcido, Levi Leddy, Edgar Miller, Kurtz, Jen Sulak, Alex Burton, and Carrie Ellingburg!!!! With more artists joining everyday it’s gonna be hard to keep up!